Monument erected to Smoky, a Yorkshire Terrier, in recognition of her work during World War Two. The monument is a sculpture of the dog nestled inside a World War Two army helmet and is also dedicated to all war animals who served. Smoky was the first documented therapy dog of record. Her service in this arena began in July 1944 at the 233rd Station Hospital, in New Guinea, where she accompanied nurses to see the incoming battlefield casualties from the Biak Island invasion. Charles Mayo, of the famed Mayo Clinic, was the commanding officer who allowed Smoky to go on rounds and also permitted her to sleep with Wynne (her owner) in his hospital bed for five nights. When in Brisbane on leave, the Red Cross asked Mr Wynne to take his dog to two military hospitals including one on the site of the Royal Brisbane Womens Hospital. Smoky’s work as a therapy dog continued for 12 years, during and after World War II. 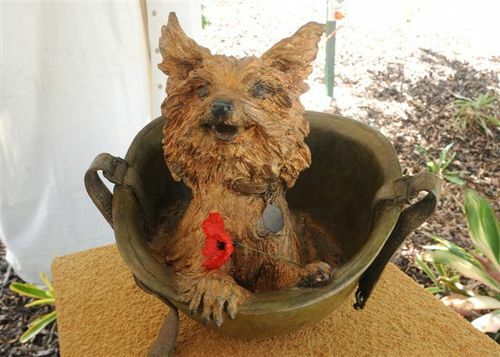 Found in an abandoned foxhole in New Guinea in 1944 during World War II, the tiny Yorkshire Terrier would become a decorated war heroine. Bill Wynne,an American soldier bought Smoky for two pounds Australian ($6.44 American) Soon after becoming the mascot for SWPA's 26th Recon Squadron, Smoky won "Yank Down Under" magazine's first prize in their 1944 mascot contest. Her status as mascot was soon elevated to that of War Dog and Heroine. Smoky was called upon to serve her country in a most unusual way and in a feat of sheer bravery, she rose to the challenge. Wynne's group was helping revamp a former Japanese airfield for use by American planes. Stringing communication wire was a major challenge. It would have taken three days to dig a new trench to lay the wires and would have exposed men and planes to enemy bombing. So, the troop's lineman wondered if Smoky could guide the wire. They tied a string to Smoky's collar and Wynne coaxed the four-pound terrier through the pipe. Smoky's special mission in the combat area of the Lingayen Gulf on Luzon resulted in teletype and phone lines being activated for the U.S. and Allied forces. After surviving kamikaze attacks, the Luzon invasion, typhoons, a sting from a 6" jungle centipede, and many other challenges, Smoky faced being left behind as U.S. troops headed home after the war. Corporal Wynne and Smoky boarded the USS General Wm. H. Gordon together. The little dog he could not leave behind was smuggled aboard ship in an oxygen-mask carrying case, heading to her new home in the United States. Smoky died in 1957 at the age of 13. There are six memorials dedicated to Smoky in the United States of America.